Download this free guide to wilderness vacations, fly-in resorts and lodges, remote destinations, guided expeditions, whitewater river rafting guides and backwoods adventures of British Columbia, Canada. Cruise the magnificent West Coast of Canada. Discover the unique marine life, the rocky shores, the sandy beaches and the great mist shrouded fjords. Go on whale watching tour for Grey Whales and Orcas ('killer whales'). Go on a bear watching tour. See the white Kermode bear, BC's famous 'Spirit Bear' in it's home, the Great Bear Rainforest. Take a Grizzly Bear viewing tour. Hike or fly-in to mountain tops and glaciers. Ride horseback to alpine meadows. Fish in pristine river valleys or fly-in trout lakes. The possibilities are endless! British Columbia wilderness vacations truly have it all! Accommodations in remote rustic cabins, fly-in lodges or world class BC wilderness resorts. Guides & outfitters offer guided backwoods adventures, expeditions, and day trips deep into the forest, to the mountain tops, or down a river. Right click "save target as" to save to your hard drive. 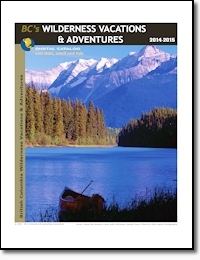 BC Wilderness Vacations Guide - A part of the BC Adventure Network. BC's largest travel network.